I originally looked at these years ago - back in 2010 I think. I was meaning to start reviewing more board books, but nothing really caught my interest....until these. I don't even remember why I ordered them for the library in the first place, except I was looking for board books with more photos. Anyways, when they arrived I was completely captivated. Secondly, and this was what completely entranced me, is these are "easy-open." What does that mean? Well, the page edges are different lengths. Duh! Why did no one ever think of that before? Haven't you ever seen little fingers trying to get the pages open? They have a cool little texture-thingy going on on the cover too. They're classic board book size, about 8x6, with Numbers and Colors being a slightly smaller format. Verdict: These are kid-tested on library patrons and my colleague's baby and definitely make the grade! 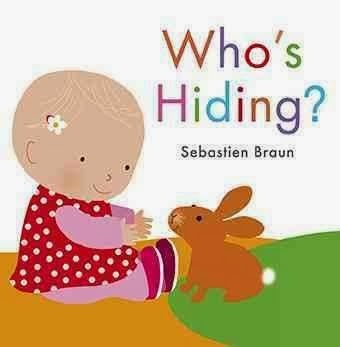 Definite must for your board book collection. These would also make great baby shower gifts! Only one thing brings me sorrow - several of them are out of print. This is an entry in a new series focusing on, well, "Spies, secret missions, and hidden facts" in major wars. Other titles include World War I, the Civil War, and the American Revolution. The chapters are "Secrets" which talks about training for various groups of spies, Churchill's Secret Army, Camp X, etc. 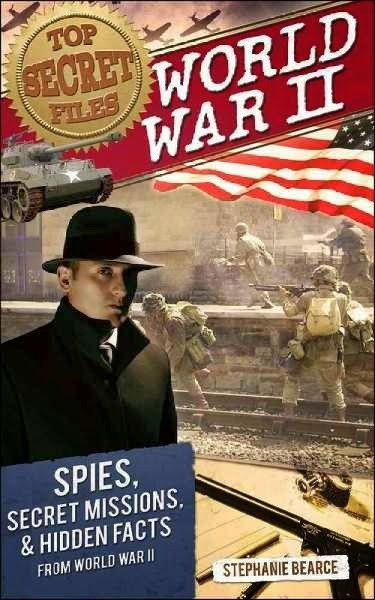 "Spies" focuses on specific spies, with a pretty decent variety. Included are Nancy Wake, Christopher Hutton, Noor Inayat Khan, Moe Berg and Joan Pujol Garcia (a man, in case you didn't know) and Josephine Baker. "Special Missions" talks about specific sabotage and undercover missions like "Operation Dynamo" and "Camouflage California". "Secret Weapons" includes both successful and unsuccessful weapons from both the Axis and the Allies and "Secret Forces" includes the various groups of Native American code talkers and the Russian Night Witches, female bomber pilots. Each chapter ends with projects and activities, including fingerprinting, creating a fake identity card, making a spy rocket, and testing out your own balloon flour bomb. Back matter consists of a bibliography, both books and websites, and a brief note on the author. The book is 117 pages and available only in paperback, in a smaller chapter book format. The layout includes lots of photos, illustrations, captions, and sidebars of information and the book is colored in sepia/orange tones. I'm kind of torn on this one. On the one hand, it has lots of exciting stories, told in a way that's interesting but not ghoulish or over-dramatic. There was more diversity than you usually see in this type of book and I was especially interested to note that the Night Witches were included, as I'd just been reading about them. The projects and activities mostly look fun and interesting. I do frequently purchase nonfiction in paperback format and these are very affordable. On the other hand, I found several typos (sorry, I marked them and now I can't find them again but I know they are in there) and slim paperbacks like this don't sit well on the shelf - they tend to get squished into the back and disappear. As I'm updating the history section soon, I'd prefer to focus on titles that give a more balanced overview of the war; this focuses more on "cool and heroic things people did". Verdict: These would certainly circulate well (until they fall off the back of the shelf) and if you're looking to add to your history collection some factey titles with a nice diversity of stories and characters these aren't a bad choice. Hopefully the typos will be taken care of if the books go into another printing. Every year I do a different run of stats for Cybils, depending what category I'm judging (or chairing). This year I am a Round 1 panelist for Fiction Picture Books and our finalists will be announced in just a few days! As a lead-up to that, I broke down our nominations to take a look at the characters featured in these stories. This isn't the absolute last word in data - there were 231 nominations, but I was unable to find all of them. I mainly recorded the data from titles that would reasonably be found in a library. A few books didn't fit into any of these categories and I left those out, or I couldn't remember specifically which category they'd fit best in (which reminded me that I should do this list simultaneously with reading/reviewing next time!). Conclusions: Animals are overwhelmingly referred to as male. Especially bears. Even when it does not accord with actual animal behavior to make them the main character. Humans are about equal in gender, but I think there are slightly more female diverse characters. I only worked one day this week, Friday. It was insane. Any vestiges of vacation were wiped away. I went over shifting with my aide, cleared off a little spot on my desk to put more holds (I had 63 holds come in while I was gone, all titles I need to look at for Neighborhoods), wrote a grant for the library gardens, and then was on the desk from 3-6 which was insane as we just turned on the security gates for RFID, a new self-checkout machine (which I didn't know how to use) was installed while I was gone, the printer crashed twice, we had several difficult and/or time-consuming patrons, but I managed to finish the STE's. Phew! Prince Lucas is lonely since his father forbids him to play with any of the peasant children - which means he has no friends. He tries to sneak into school in disguise, but is immediately recognized. Luckily, his mother intervenes on his behalf and he gets permission to play with his old friend, her seamstress' daughter Clara Gills. 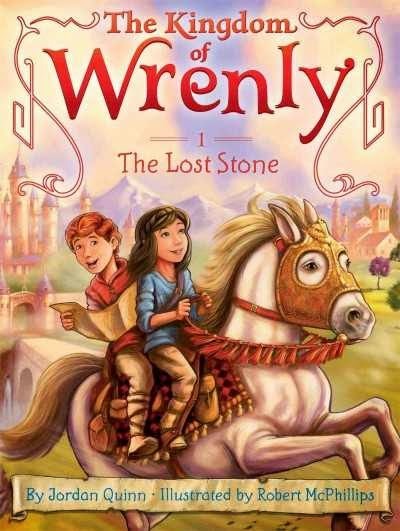 Together, they set out to solve the mystery of his mother's missing emerald, visiting different islands around Wrenly with various magical creatures from fairies to trolls. The black and white illustrations include a classic fantasy map, inset pictures of different magical creatures, and various scenes of Lucas and Clara's adventures. At just over 100 pages this seems like the perfect beginning chapter book, especially since fantasies for younger readers are difficult to find. I...really didn't like it. But it's hard to tell how much of that is my feelings as an adult. It's so hard to find fantasies for younger kids, but when I do it's so disappointing to see them stick to the same old tired stereotypes of class prejudice. When the king is thinking about the problem of Lucas' loneliness it says "he couldn't allow him to be friends with the peasants. Even they would think it was strange." That just....seriously? WHY do we need to perpetuate the emulation of feudal societies to kids? The whole book reads like an episode of Disney's Princess Sofia. Why does he have to be a prince at all? And everyone is white of course. If the kingdom is enlightened enough to allow girls in school, girls wearing pants, and all the different fairy tale creatures to coexist (suitably under the control of humans of course) why can't they have diverse characters? Why do they need to have such an outdated ruling structure? And, of course, although his mother puts in a good word for him, his father has all the power. The whole plot of him not being allowed to play with the kids was completely unnecessary, although I suppose it could be part of the story in later volumes. Verdict: I can't decide. My objections to this are from an adult viewpoint and it's not like I don't have plenty of Disney and Disney-esque materials in the library already. The writing is no worse than the average beginning chapter series (but no better either). There aren't a lot of reviews, but that's not unusual for a beginning chapter series and they're generally positive. I've heard from friends and parents online that they like the series and I am sure my patrons would love it. Is it fair to penalize a book for what it could have been and what it isn't, rather than what it is? For the moment, it stays in my backlist as I think about it. This review was previously published. I rewrote and edited it. A little girl wears her tutu despite her family and friends being tired of seeing her in it no matter what she's doing. The text is simple and rhymes "She wore her tutu to school. "Not again," her mother sighed./She wore her tutu in the pool. "Not again," her father moaned." But the rhyme scheme doesn't flow well. I like Nakata's colorful and sweet illustrations, except for the one where her brother has weirdly exaggerated teeth, but they're too blurry for the average toddler. 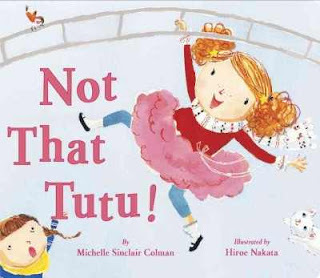 The cover has a little frill of actual netting over the tutu which will, at my library, probably be torn out by the second checkout. Verdict: This might have made a passable picture book but I don't think it works as a board book. I don't think the board book audience will even understand what's going on. It might have made a cute picture book for 3-4 year olds though. I've read several "the glory of research" books and was left completely uninterested. This, however, was different. The book starts with a brief chapter introducing Adrienne Mayor. She was not traditionally educated, with degrees, but she was curious and observed the world around her, had access to libraries and travel, and was looking for something to be her passion. Then she decided to research mythological creatures, specifically the griffin, and see if they had basis in fact. 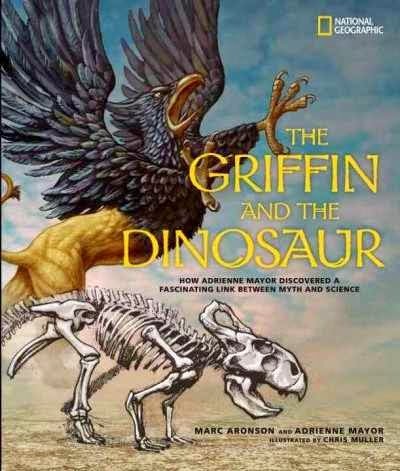 This book takes us through her research, finally relating the myth of the griffin to ancient people's observation of fossilized dinosaur bones. Along the way she suffered many setbacks but also received help from sympathetic professors and in the end not only proved her theory but showed that the observations of "uneducated" people could be important. The book is in a large, picture-book format and has only 50 pages. But those pages are crammed with photographs, illustrations, maps, artifacts, and, of course, text. The text is presented in columns, which I found a little off-putting. Back matter includes further reading, resources, glossary, index, and a note from Marc Aronson on his involvement in the book. While this isn't the typical nonfiction book I'd purchase for my library, several things set this apart. The lively writing draws the reader in through a high-interest topic - mythological creatures and dinosaurs - and keeps their interest by following the twists and turns of the plot. It's presented as an adventure with a mystery and kids will definitely stay with this one to find out the solution to all the clues. Verdict: The layout is not quite what I would like - anything that looks like a picture book is a hard sell for my older readers (and their parents). However, the book itself rises above that and will definitely grab kids' attention. Recommended. I am so tired. Monday - a gazillion interruptions and questions and things, but I still managed to get through most of the Rs. The Rs were weird. A disproportionate number of them were checked out, so I will have to wait for them to be returned to go through them. All the take home storytimes are gone but I didn't have time to make more. Tuesday I finished the Rs and started the Ss. There are a LOT of missing Ss. I had to clean out the storyroom, where I had dumped all the random accumulation in my office yesterday and go out to kindergarten, where the kids had very obviously not had enough recess. Thursday I started with my three outreach visits (also suffering from holiday ennui), then came back for two hours on the information desk, then I left to start my vacation early, since I'd worked so long last week. I made it to the STE's. Oh well. I really hate this time of year. I know, I know, "where's your festive spirit?" well, let me tell you, it's really hard to be festive when you've got a very small window of time bracketed with several huge back to back programs, urgent projects, and then everything starting all over again without adequate time to plan or rejuvenate. My programs resume January 10th and I took a few days of vacation, which really pushes things down to the wire, especially since I will be interviewing people around or after the 12th. But I can't take time off during programming for more than a day here and there and I have other things (Cybils) that need to be taken care of. So, there it is. I keep telling myself if I just make it through this semester, I will have a year of pre-planned programs, a trained associate, and everything will be easier. I don't feel it right now though. First time anyone has ever asked for Hannukah books. I actually had some to offer, mostly because we forgot to ever bring them up with the Christmas books like I usually do. Treasure Hunters by James Patterson - read-alikes for a seven year old. I suggested 39 Clues, although the caregiver was concerned that it not be too violent or have "evil" in it and I thought afterwards that Benedict Society might have been a better choice. Oh well. Last August, when I was laying out the fall programs (and over-planning as I always do) I decided to add just one more storytime in December, the week after I usually end, because I hate to lose that Wednesday when there is no four year old kindergarten. I have a We Explore Favorite Artists and We Explore Nature program series, so why not We Explore Favorite Stories and indulge my love of introducing children to variations of a single folktale? Gingerbread Man of course, since it's close to Christmas. I was very pleased to see a new Gingerbread Man inspired story arriving at the perfect time. 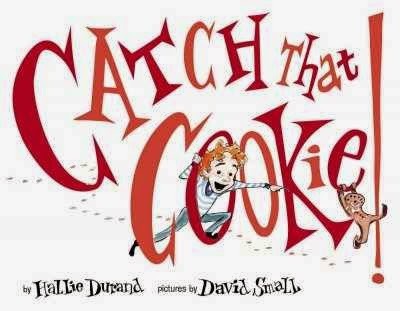 In Hallie Durand's riff on the classic story, Marshall is skeptical about the Gingerbread Man stories; he knows cookies can't REALLY run away. But when his class bakes cookies....they disappear! Is the Gingerbread Man real after all? Marshall and his class go on a wild scavenger hunt through the school, following the clues their Gingerbread Men left behind, until they finally find their lost cookies - and Marshall finds a little magic. David Small is back with his trademark style. The main characters, Marshall and his teacher, pop out of the landscape of faded figures as the rest of the kids chase after the gingerbread men while Marshall carefully considers all the facts. Marshall's school is washed with colors, orange, purple, green and more, contrasting with the black and white sketches of some parts of the setting and the colorful washes of Marshall and his activities. Verdict: Although this is directed at older kids, it still works fine in a storytime if you adapt it a little. It's a fun idea for the holidays and of course Small's illustrations are always spot-on. Recommended. I purchased this as a picture book, but when I received a review copy of it in board book format, I thought it was even more brilliant! There are only two words in the whole book, "mine" and "woof". Just for the record, the word "mine" is used nine and a half times and "woof" appears once. The story is told through Barton's soft but brilliant color illustrations. The plump, rosy-cheeked toddler featured on the front cover is introduced to a baby and a stack of toys, with a dog in the background. Naturally, her first response is to scoop them all up, one by one, saying "mine!" before the baby can get any. Unfortunately, there's just a few too many toys and as the toddler frantically tries to collect them all, the baby and dog join in the game with enthusiasm and toys go flying. The two children quickly discover a much better game they can play together - dumping the toys in the dog's water dish. Spontaneous sharing ensues and grows until the final "mines" are for new friends. The gradual sharing between the children is realistic, if a little overly positive. They don't play together at any point, but they are aware of each other and eventually work out a game they both participate in, as children of that age are capable of doing. I kind of wonder where the moms were while the kids were dumping toys in the dog's water dish, but that's all part of the fun. It reminds me of Barbro Lindgren's Sam books (or Max, if you're going for the original Swedish). Verdict: I think this one works really well as a board book, maybe even better than a picture book. There are lots of different things to identify in the pictures and parents will appreciate the humor in the story. It's always a little difficult for me to judge "things about history you never knew" types of books because I've read so many of them - I'm no longer sure what is or isn't commonly known! Judging by my conversations with middle schoolers though, pretty much any history is news to them. Anyways. The author's note and introduction explains that this isn't about debunking history; it's about looking at the real people and events behind the legends. Each chapter focuses on a different historical character, first introducing their legendary significance and then explaining the reality behind the legend. The historical figures covered are Confucius, George Washington, Pythagoras, Hiawatha, Gilgamesh, Major William Martin, William Shakespeare, Pope Joan, Homer, Prester John, Huangdi, and The Turk. Confucius really existed, but he was far from the wise sage his followers portrayed him as. George Washington was a more complex and human figure than his legend suggests. Pythagoras, like Confucius, has his legend built by followers long after his death. Hiawatha (not the one you're thinking of) may not have existed at all. Gilgamesh may or may not have existed at all but his legend is certainly larger than life. Major William Martin, a corpse that played a large part in WWII was a complete fabrication from beginning to end. William Shakespeare, well, you know the controversy about him. To Bacon or not to Bacon, that is the question...Pope Joan was a legend that grew out of all proportion - or did it? Homer never existed except in the imagination. Prester John may have been based on a real king, but quickly became a mythical figure with surprising staying power in the medieval world. Huangdi, the Chinese emperor reputed to have invented, well, pretty much everything, never existed. The Turk was a famous automaton, capable of independent thought and action....and also a complete fake. Asides defining language or adding humor are sprinkled throughout the book as well as additional facts. Back matter includes sources and notes from the author. This was interesting and the writing definitely caught and held my attention. 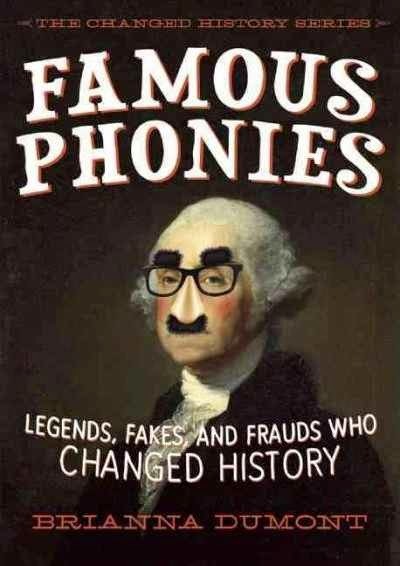 I think kids would enjoy the snarky tone and humor and would be interested to learn about the different historical figures. However, there were some major flaws in the book that would keep it from being a library purchase for me. The people selected seem really random until you look back at the subtitle, "Legends, Fakes, and Frauds who Changed History." The problem is that the historical context is really not emphasized throughout the book and the chapters don't tie together well. The majority of the historical figures are from ancient history and didn't exist at all, but then you throw in George Washington, William Martin who wasn't really a person but a military maneuver, and The Turk, a machine. They aren't presented in chronological or geographical order either. Only in the last chapter on The Turk did I feel like the historical impact of the figures was really explained, but then the book ended abruptly without drawing conclusions from the figures presented. The asides, which at first seemed to be an in-text glossary, but then turned out to be something else, really distracted me from the text. Some of them define things already defined in the text, some of them add additional facts, some of them just seem to be humor footnotes to the story. While I enjoyed the humorous tone of the text, I think it went too far and it was difficult to tell the difference between the historical fact and legend. In the section on Pope Joan, a brief sentence is all the clue you get that she's a legend and then the story hops into how and why her legend persisted, leaving me confused at the end as to whether or not she really did exist. Verdict: I found the writing interesting and the concept had promise, but (and I say this knowing nothing of the publishing industry besides they magically produce books) I think the book would have benefited from a better editor and layout. I wouldn't purchase this to promote as a book about history, but as a book of interesting stories about people it would be a perfectly acceptable additional purchase. This would normally be my last week of programs, but I still have a ton of outreach visits and a gingerbread storytime that I'm hearing a lot of interest in next week, so....yeah, it's not over yet. Started the week with either the remnants of a cold or the sinus infection that never ends, it just keeps coming back. I had intended to get a lot of work - reviewing, cooking, and misc. stuff done last weekend but I mostly just slept and felt sorry for myself. No time for that this week though! On top of still working on neighborhoods (determined to make it to the S's this week!) I had programs, newsletters and publicity to write for next year that needs to go out now, scheduling and planning for the position that's posting next week, and just general madness. I powered through although coming back after Friday was really, really hard. Saturday was awesome, once I got into it - we have a new partnership with the local dance studio, after a slow start lots of people showed up, and it was a quick clean-up. Lexile around 600 - really wanted something shorter/easier, but nothing came up at the right level. I gave her Julie Bowe's My Last Best Friend and suggested a couple other shorter things. Aidan used to think his parents' space-themed motel was pretty cool. But now that he's getting older he wishes they could live somewhere else - and that it wasn't so much work! Even the weird stuff, like the strange new girl, Dru, and his friend Louis' obsession with aliens isn't much fun anymore. But when there's a series of strange and frightening occurrences around the latest space launch, Aidan finds himself launched into a shocking adventure and more in tune with aliens than he ever thought he'd be. However, I'm not sorry I bought this for the library and I definitely recommend it. Why? 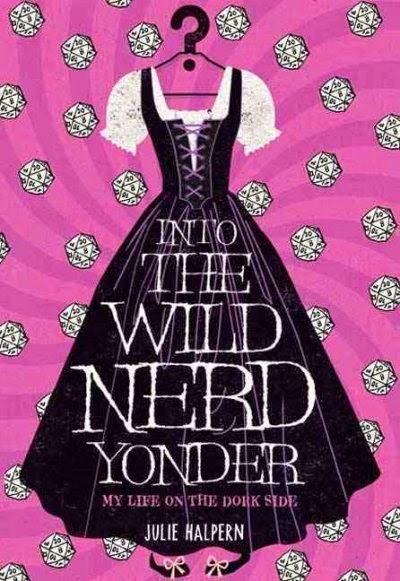 Because it's so hard to find simple, plot-driven, short books for the middle grade age group. Bonus points that it's science fiction (even hard to find, despite how much kids love a good alien adventure) and the touch of diversity with Louis' prosthetic leg and Dru's alien origins. 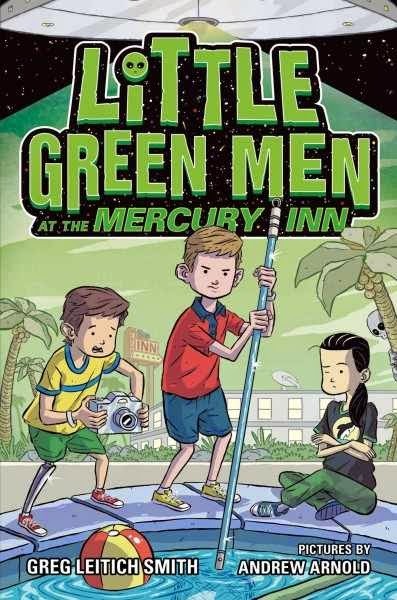 Verdict: This won't win any awards but kids will thoroughly enjoy it and will be pleased to find a fun story about aliens that's not daunting in length or text. Recommended. This is the board book version of the previously released picture book. Board book versions are a toss-up - sometimes they work, sometimes they don't. I think this one works really well. The board book cuts down the cover illustration and removes the end papers, and compresses each full spread down into the 5x5 board book. Il Sung Na's simple but lovely text makes an excellent read-aloud for young children, with just one or two short sentences on each page. In case you haven't read the picture book, it's basically a list of what different animals do in the winter, "Some gather extra food for winter, While some travel far...to find things to eat." and etc. 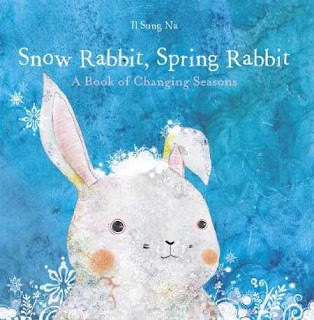 It ends with a joyous welcome to spring as the rabbit, which appears in every page, changes to brown. The illustrations are even more entrancing. Although they are delicately detailed, they are also colorful and exciting and don't lose much of their detail by being compressed into a smaller form. The patterns in the background of the art, both splotches of color and spiraling shapes, will especially catch the eye of older toddlers. Verdict: I can see many toddlers enjoying listening to and touching this book and I would recommend having both the picture book and board book. This was an excellent choice for board book format. This isn't exactly nonfiction, but it's something I'd consider nonfiction enough for reading aloud. 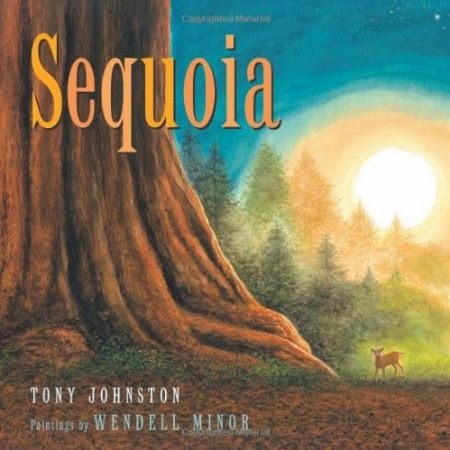 Told from the point of the sequoia itself, Tony Johnston's gentle poetry takes the reader through the days, seasons and years of the tree from first morning light, from hot summers to crackling fire and quiet winter. The animals on and around the trees are mentioned and the tree's place in the ecosystem gently woven into the poetry. Minor's lush oil paintings capture the majestic beauty of the sequoia and its surroundings. I'm in awe of how carefully he captured the sheer scale of the trees, shifting the perspective to show different aspects of the massive tree. Some of my favorite pictures are the ones that incorporate wildlife. In one, a single branch stretches against the green of the tree and the hazy green of the surrounding forest and sweeping out of it is a stunning blue jay, flying towards the glowing sun. In another, a woodpecker takes up almost the whole of the spread, only the straight trunk and swoop of branches overhead against the empty sky and an eagle in the distance give an impression of great height. Back matter includes "Some notes on Sequoias" including a few drawings of the trees and a map of their range. There is also a brief bibliography. Verdict: While this isn't going to be for everyone; the poetry is too slow-paced for a really good read-aloud, especially to younger kids, it would make a nice supplement to a tree storytime by reading selections and it's a truly lovely book. This is our new I Spy aquarium, made by a volunteer. and mark off - and I can add to it. This is always the time of year when I am at that delicate point between "I have a ton of time let's plan All The Things for next year" and "OMG Programs Start Next Week and Nothing Is Planned". I've got more programs in December this year, so it's a bit augmented. Also, I'm only in the Ks in neighborhoods. But I am grimly determined to FINISH by the end of the year, even though my replacement cart for next year is reaching gargantuan proportions and I'm feeling stretched very thin. By Friday, I made it to the Ms! I passed the halfway mark! Forensics - storytelling. I gave her Little House chapter books for both "party" and "stories about Wisconsin" and Each Kindness for "injustice" and Scary Stories to Read in the Dark for "stories to tell around a campfire. Rescue princesses - I just bought these and they are all checked out. I suggested Never Girls instead. This is a simple but sweet story. 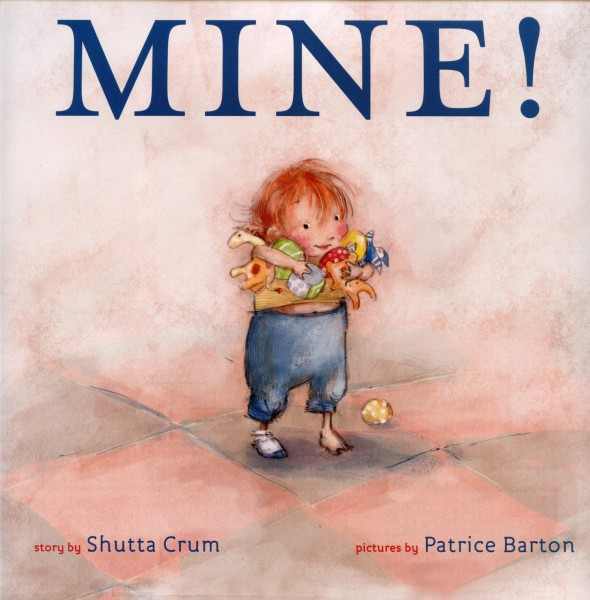 Sometimes it's nice to have a simple, fun picture book that's not ground-breaking or unique or award-winning - just a nice, solid story with friendly illustrations. Simple couplets tell the story of puppy Flash who just keeps getting into trouble. "Sniff shoes. Lick shoes. Gnaw shoes. More shoes! Uh-oh...your shoes? Bad dog, Flash." 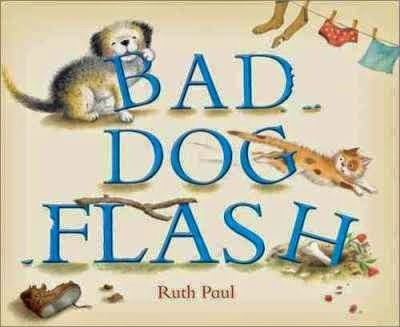 Each mishap ends with a "Bad dog" for poor Flash until he finally does something right. Ruth Paul's illustrations have a cozy, fuzzy feel that I usually associate with British picture books (she's from New Zealand, so I suppose was inspired by many British titles). Flash is an adorably naughty puppy with faint pink spots on his cheeks and a sprinkle of speckles across the pages showing the trail of dirt and destruction he leaves behind. Verdict: A light and fun story. Great for toddler and preschool storytimes, when the kids will enjoy chorusing "Bad dog, Flash" and finding the puppy's naughty behavior on each page. 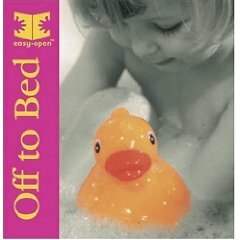 This is a classic and adorable board book. The 8 pages of text are each a simple question, asking the reader who's hiding under a leaf, behind a bush, etc. When you lift the flap, the name of the animal is shown in bold print. The illustrations are a little more simplistic than Braun's picture book titles, but perfect for this audience. Smiling babies, with a range of skin colors and genders, happily peer behind and into the various items. The pictures are drawn so a large portion of the animal can be seen, giving a clear hint on where to look. The flaps are thick and sturdy, but the attaching paper "hinge" could use reinforcement. The book is about 6x6 inches square. Verdict: I don't usually do lift the flap board books (or any books) but these appear to be quite sturdy and easy to reinforce if necessary. I think the white backgrounds might get dirty faster than I like, but this is really cute and so nicely designed to appeal to a toddler that it's worth it. When I read this, I realized that THIS is what I wanted Sky Caves to be. This isn't really fair, since they're about very different archaeological discoveries, but the topics are roughly the same - an archaeological discovery with major historical impact. This book, however, drew me in from the start and held my attention to the very end. The introduction explains how the author first encountered "Lady Dai" and her treasures and got the inspiration to write this book. 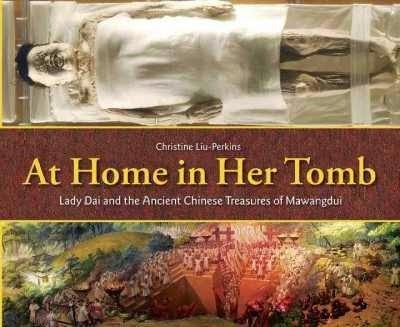 Each chapter is introduced by a fictional recreation of an aspect of Lady Dai's life which then segues into a discussion of that aspect of the discoveries made in the tomb. So, a brief glimpse of Lady Dai caring for silkworms opens the chapter on the silk books that were discovered in the tomb. The chapters not only discuss the archaeological discoveries, they talk about their historical impact and the context of the time period. So the chapter on silk books not only talks about how the discovery of these books greatly added to knowledge of the time period and how very little from that time has survived, it also talks about the value of silk and the the subjects of the books. Drawings, photographs, and artists' impressions fill the book, all with thorough captions. The book concludes with a reflection on the people of the time period and a brief history of the Qin and Han dynasties. There is also a time line, map, glossary, author's note (including a note about the "imagined scenes"), sources of quotations, bibliography, and index. Verdict: While this is a challenging book, a strong reader will be drawn into the story by the excellent layout and strong writing. Even if you don't have much interest in Asia or archeology at your library, I'd still give this a chance. It's not only a fascinating look into an amazing archaeological discovery and a great introduction to a history that most American kids don't know, it's also a great introduction to excellent writing and research. Highly recommended. This week at the library; or, Guess whose turn it is to work Thanksgiving weekend? Not that I'm complaining - we all share the holiday weekends pretty equally. I'm just kind of tired right now. No programs this week - we had a staff meeting and then I had another meeting with Pattie and my director to finalize the schedule for next year. I spent most of the time I was here cleaning off my desk, working on neighborhoods, and working on the schedule. We close at 5:30 on Wednesday (I came in late because I bought a freezer! but then Best Buy's weird insanities made it impossible to get it delivered, so one of the library staff really nicely came over to help me get it home. I left early because I was working Saturday) and are closed Thursday and Friday. Some libraries around here are open Friday, so we're lucky! I was excited when I heard about Shannon Hale's new series, mostly because I mainly heard it described as a graphic novel. Dear people; please note that a book containing illustrations is not automatically a graphic novel. However, even though it turned out to be an illustrated beginning chapter book, I fell in love with plump and energetic Princess Magnolia. The story opens with what appears to be a typical princess setting; dressed in frilly pink, Princess Magnolia is having tea with the Duchess Wigtower. Everything is absolutely perfect. But wait! Princess Magnolia has a secret - when the monster alarm sounds she turns into...the Princess in Black and defends her country from monsters! Can she keep her secret from the nosy Duchess Wigtower and Duff the goat boy? LeUyen Pham pictures a princess who is perfect - perfectly awesome that is! 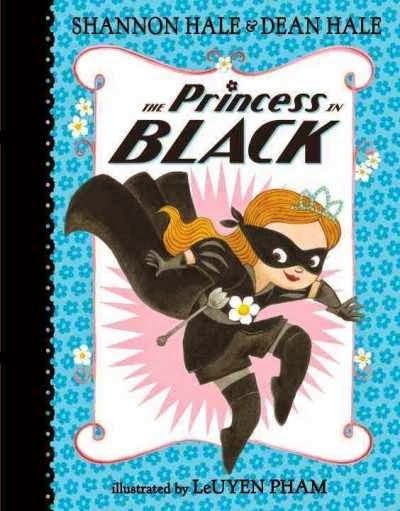 Whether dressed in her fancy princess gowns or sporting svelte black and a sparkly crown, Magnolia's exuberant personality, smarts, and self-confidence shine through every page. She looks like an adorable and very real little girl with chubby cheeks, and not a hyper-sexualized doll. Pham's bright colors and cute characters are a sweet match for this story; like the text, they just sparkle with personality. Verdict: This is a delightful new beginning chapter series, from the perfect blend of sparkly princess and action heroine, the dark-skinned goat boy, a personality in his own right (coming soon - the Goat Avenger!) and the silly monsters. I can't recommend this enough; it's got something for everyone and I think it will find immediate fans in your library. A brief introductory sentence explains that Fox usually loves the wind but not today. The rest of the story is told through the pictures with the only text being opposites - "far, near", "left, right" etc. At the end, another sentence explains that Fox really does love windy days. 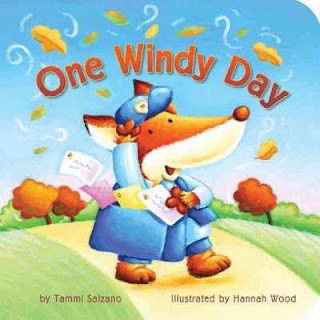 The story told through the pictures shows Fox, a mail carrier, and all his letters being blown about by the wind, then collected with help from his friends. This is a Tiger Tales book, so the art is very cute with lots of fuzzy animals. Some of the leaves are sparkly foil and slightly indented on the page. The cover is padded and the book is about 7x7 inches. The pictures are cute, as I said, but somehow out of focus and blurred, as though they were made with poor image resolution. Verdict: Cute, but not enough that I feel we really need it. Plus, I always feel that padded board books are not the best choice for libraries - I don't think they're as sturdy. An additional purchase. This book is a sort of Scientists in the Field for younger readers (and from a different publisher). This book is about several archaeological expeditions to Mustang, in Nepal, and the investigations into the caves there. 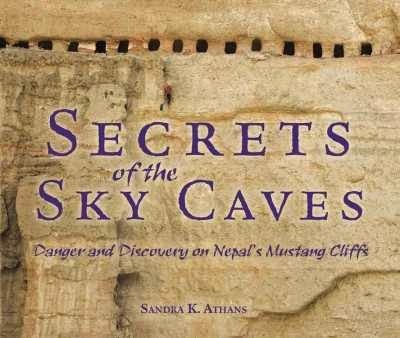 The book introduces historical and cultural information about Nepal and the history of the area under investigation, then details several expeditions that first photographed and then excavated the caves and what they found there. Sidebars and sections detail historical information, legends, religious and cultural facts, and archaeological information. The book is filled with photographs of the mummies, cave paintings, and other artifacts discovered. Back matter includes a Who's Who of people involved in the expedition, a timeline, source notes, glossary, bibliography, and further information. There is also an index. I just couldn't get into it. I finally forced myself to read it because it had to be returned to the library, but I just couldn't get interested. Part of the reason was I felt...uncomfortable with the whole expedition. Only on the third expedition is anyone even remotely local involved in the actual investigation. There are only brief mentions of interactions with the local people and all the experts are from overseas, except one archaeologist in the third expedition. One of the things I like about the Scientists in the Field series is that they give almost equal face time to local interactions, even if the local people aren't "experts" in the field, they talk about their knowledge and how they contribute to the investigation. I didn't see that here. Another reason I had trouble getting into this was it felt like a lot of information crammed into a small space. I think it would have been more interesting if it had focused on just one expedition instead of trying to pack the entire history of Nepal and an series of investigations spanning two decades into a 60 page book. Verdict: I just couldn't get into this and I have a hard time thinking of any kids who will appreciate it. For a bigger collection, or if you have archeology fans or a Nepalese population, it would probably be useful. This week at the library; or, My extra week! Somehow I thought this week was Thanksgiving. It was nice to discover there was an extra week in here, because I had a ton of work to do! Beginning chapters for a Captain Awesome fan - I gave them Hooey Higgins, Jo Schmo, and Down Girl and Sit. The dreaded 1000 lexiles strike again - and half of what I looked at was checked out. They went with Blizzard of Glass (which the mom said sounded like an I Survived book and I was like Yes!) and Catherine Called Birdy. And again - went with Savvy and Phantom Tollbooth this time. There are the classics that you know why they're classics, be it clever marketing, perfect grasp of the audience, sheer literary and artistic merit, etc. Then there are the books you remember from your childhood; they may be utterly weird and completely outdated, but they are a part of you. Then there are the books that fall somewhere in between. The ones that you loved as a child, that have some outdated aspects to them, but somehow hang on, year after year after year. Phoebe and Judy Dunn's photographed stories of farm animals fall into this last category. When I first realized they were still in print, I was thrilled and decided to treat myself (and my library) to a collection. To my delighted surprise, it became one of our most popular titles. My personal copies from my childhood have long disappeared, but I found the originals were easy to replace and just as lovable as ever. In The Little Rabbit, Sarah finds a white baby bunny in her Easter basket. Sarah is an adorable girl with freckles and a gap-toothed grin, just as sweet as her fluffy new pet, Buttercup. The simple story talks about Buttercup growing up and their little adventures, including information on pet care in a natural and interesting way. Buttercup meets Sarah's friends, gets lost, and goes on picnics. Eventually, she gets big enough to have babies of her own (no male bunny is pictured or mentioned though) and she has seven babies who get into lots of trouble! Finally, it's just Sarah and Buttercup again, the way they like it. 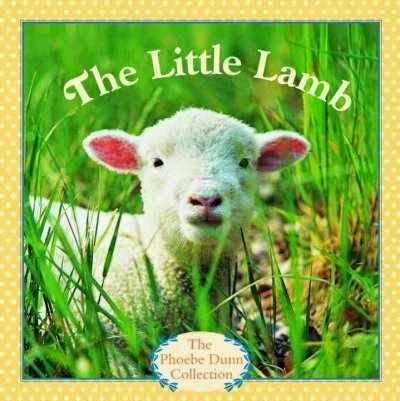 The Little Lamb features Emmy, a pig-tailed little girl in sturdy jeans and sweater, who adopts an orphaned lamb, Timothy. He grows fast as she cares for him and introduces him to other animals and places on the farm. But eventually Timothy gets too big - and causes too much trouble - and goes back to the farm, where he happily joins in with the other half-grown lambs. The Little Duck, Henry, is found by an unnamed boy as an egg by the pond. 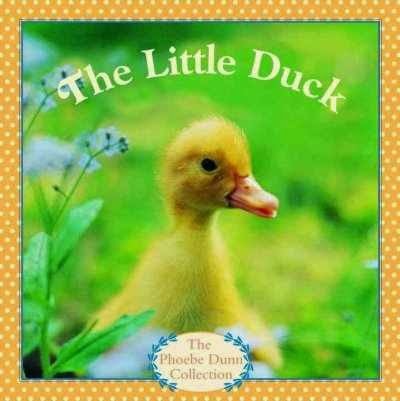 This book follows most closely the duck's life cycle from hatching to changing from a fluffy chick to a beautiful white duck. Eventually, he wants more than his little blue pool and finds his way back to the pond and a beautiful girl duck. Verdict: There are plenty of farm animal books out there, but these photographs just seem to really strike a chord with parents and children alike. I recommend taking a look to see what's currently in print and trying out a few, be they paperback, prebound, or board books. These are reprinted so constantly that I'm not going to list a specific ISBN. Most of them are still in print, either in paperback or prebound, or are soon to be republished as board books. They're the books that just keep going! Just search for Judy and Phoebe Dunn. The copies pictured are the latest paperback versions in print, but I personally own older paperbacks. This is a board book version of the original, oversized picture book. I really liked some of the other things Britta Teckentrup has done, but this one was disappointing. It's an annoying cliche that I detest - grumpy adult cat, appears to want to be alone but is really lonely alone, meets a friendly kitten who shows him how to be friends. Because nobody could possibly ever want to be alone and if you're not smiling all the time there's something wrong with you. Not that I'm biased. At all. Teckentrup's illustrations are still fun, with broad, bold strokes of color and shapes and delightfully fuzzy details. However, the story has not been cut down much and especially for this small board book (7x5 inches) there is way too much text. Also, the storyline itself is not developmentally appropriate for a toddler. 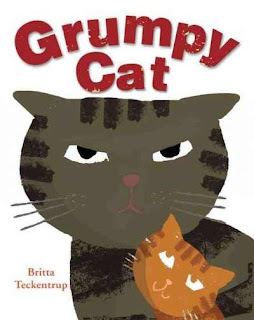 Verdict: Teckentrup has done some really good board books for the toddler crowd, like My Book of Opposites, and I strongly recommend those. If you absolutely must have this book, purchase it as a picture book. Also, we are no longer friends, you anti-introvert person! Nicola Davies is one of my absolute favorite authors of nonfiction for young children (the others are basically all Peachtree authors, in case you're wondering). She doesn't disappoint in this new book tackling a unique subject: microbes! The book starts out by giving some scales of the size and number of microbes, then talks about how they are everywhere. There are comparative images of large and small microbes, and then my favorite spread which shows lots of different kinds of microbes so you can see all the unique shapes and patterns. The book then explains how microbes can eat anything and that they transform things into something else, like milk into yoghurt! Davies attempts to explain how rapidly they split and increase with a stunning visual across two pages. 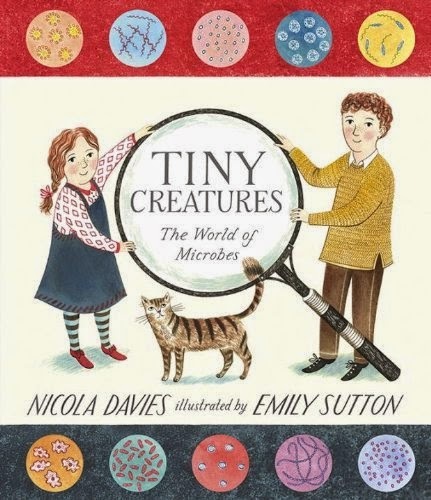 The story finishes with talking about how "the wrong kind of microbes" can make you sick and some simple precautions (like washing your hands) but reassures readers that there are very few microbes that will make you sick. The book ends with two gorgeous spreads showing the amazing BIG things that tiny microbes can do. "They are the invisible transformers of our world." Sutton's illustrations are the perfect accompaniment to Davies' simple but beautiful text. She draws both cozy, cheerful pictures relating the abstract idea of something so tiny you can't see to the things you can see, and also stunning, delicate illustrations of microbes themselves. Verdict: This will work in a storytime with an older audience; probably four and up. It will also be a great book for teachers and families to enjoy in smaller groups to pique children's curiosity about the world around them. Highly recommend. Humor is really subjective and seems to get more so the older you get. These are books I found hilarious, bearing in mind I rarely read teen books and have, according to my friends, the sense of humor of an eleven year old. Jessie is ready to join a new group of friends. The band geeks? The nerds? The punks? THE NERDS? I reviewed this one a long time ago. A bad day for Voodoo is my favorite, but I liked I have a bad feeling about this too. I reviewed both, a rarity for me in teen books. Bored with traditional palace life, a princess goes off to live with a group of dragons and soon becomes involved with fighting against some disreputable wizards who want to steal away the dragons' kingdom. These are what reviewers and teens have told me are funny. Still working on NEIGHBORHOODS, piles of stuff on my desk, Cybils, planning the last bits of programs for this year. The homeschool thing went well - I basically just pulled together bits of all my regular school tours and then had some crafts. The kids really loved the scavenger hunts. There were about 25 people - some of them were just random people with toddlers and preschoolers who happened to be there and tagged along. 74 people came to Lego Club. Then the next morning I had to take down all the tables and run back to back tours with my director for 70 four year olds. THIS is why I never have planning time! I am trying desperately to keep my mind off next summer. You are planning WINTER and SPRING mind, not summer! Not yet! But I do have to at least briefly think about it because, if I'm going to step away from the CSLP theme which I definitely plan to do, I have to convince my director now because of the crazy ordering schedule of CSLP promotional material. And then I realized I'd had an error in my formula in my budget spreadsheet and every time our cataloger had ordered teen fiction it had flipped over and back into the budget so I overspent my budget by $600. This was a rather fraught week. 800 lexile books - she wanted Jigsaw Jones, but it wasn't the right lexile. We went through the list and she ended up taking Allie Finkle and an Andrew Clements book. 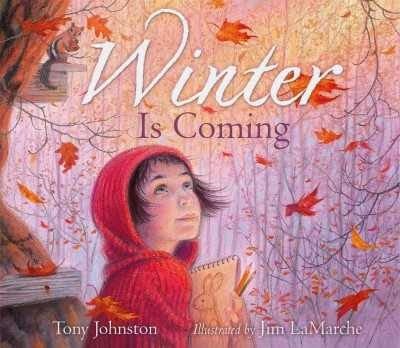 I grew up loving Tony Johnston's Amber on the Mountain and of course I love LaMarche's gorgeous, colorful, emotional paintings. Who doesn't? However, I was doubtful about liking this because it seemed too...poetic. Books of poetry don't do well in my library. "It is a cold September day. Fall is still here but ice is in the air. I feel it. Winter is coming." And then, in a few more brief pages, winter is here. In the final wordless spread the girl walks through the snow back to her warm house and the last set of endpapers show the sketches and notes she's made of the animals she's seen. LaMarche's paintings always seem to have an inner glow but these are, I think, the best he has ever done. Each spread captures a different hue of autumn, from rich gold to softly fading brown. Each page is a different part of autumn, a different animal preparing. You can feel the silence and chill of the fading season. Verdict: If you only buy one "literary" picture book for the year, make it this one. I've added it to my personal wishlist, which I don't often do. Highly recommended. A beautiful, beautiful book. First of all, just look at that cover. Doesn't it make you want to giggle? I've been chuckling every time I glanced at it, and now that I've read the book my chuckles were not ill-founded. It's time for a bath and a motley collection of dogs are going to the groomers. Baths, haircuts, and fancy touches are in store! But, uh-oh, something's gone wrong! This is a level 2 Step Into Reading, which in their system means "reading with help". There are enough familiar simple words that a child can feel confident on their own but plenty of new fun words to sound out with a little help. 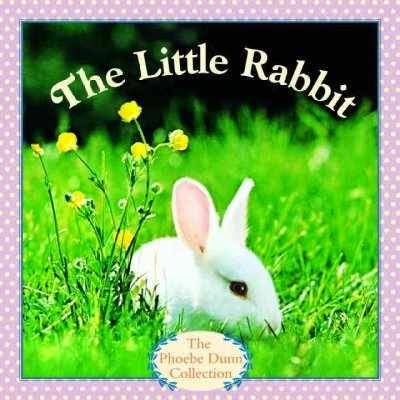 Even with the limitations of language in an easy reader, Joan Holub has created a fun rhyming story that kids will enjoy working their way through and parents and teachers won't mind listening to for the fiftieth time! Tim Bowers' illustrations are the perfect touch of hilarity, especially when he matches the dogs' crazy 'dos to their groomers' own haircuts. The pictures enhance the text without offering too many clues to readers. Verdict: Hand this one to fans of Capucilli's Biscuit series and kids who like funny stories and stories about dogs. It's also going to be a good starter for kids reluctant to try stories on their own, as the fun pictures entice them in to try the chewy words for themselves! Highly recommended. This is part of a new series called "Did you know?" Just as the title says, it's a collection of fun facts. They're loosely linked together and hilariously illustrated with colorful cartoons. There are no sources or bibliography; the only backmatter is a page of additional facts. I had to read the book more than once to really get used to the sometimes flimsy segues. 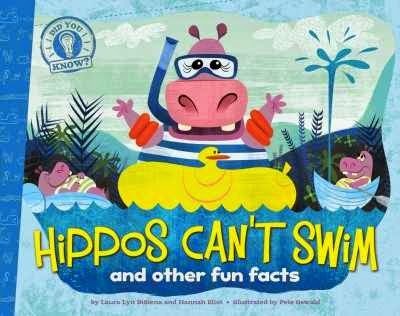 It starts with some facts about hippos, including that they can't swim...but sea turtles can swim and go faster than you think, much faster than jellyfish...speaking of jellyfish, here are some facts including that some species have bioluminescence...like fireflies! who can be different colors...unlike zebras who aren't lots of colors but have interesting patterns and are attracted to black and white things...not like racoons who like shiny things and can be found in garbage cans....on the other hand, chipmunks are more likely to be found in the woods, filling their mouth pouches with food for hibernation...kangaroos have a different use for their pouches, here are some interesting facts about their jumping abilities...another animal that jumps is a rabbit, did you know rabbits live underground? Bats, on the other hand, may live above ground or in caves and sleep all day...not like ants, who live underground but are awake a lot and live in colonies....like herons who are really tall....but hummingbirds are small....blue whales are bigger than everything "And unlike hippos...blue whales sure can SWIM!" So, that's a LOT of facts packed into this little book. The illustrations are cheerful and definitely attractive with bold colors and lines, pop-eyed cartoon animals, and funny details like speedy sea turtles in sweatbands and chipmunks with food pouches distended bigger than their entire bodies. Verdict: This wouldn't work well for a school report or an older kid wanting to learn about a specific animal and it's too long for storytime or reading as a story to a little one, but it's just right for that in between age of 1st - 3rd grade when kids really crave collections of facts and will enjoy the cartoon animals. You can buy this whole series in paperback, but I would expend the extra money to get them in hardcover as they will see a lot of use.